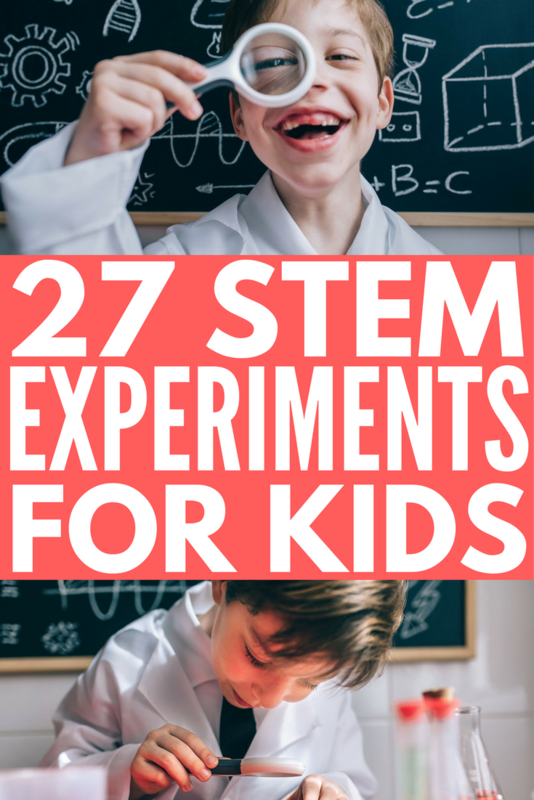 STEM experiments for kids: 27 fun ways to help them learn at home! If you’re a parent of school-aged kids, chances are you’ve heard the word ‘STEM education’ in some way, shape, or form, which is essentially a curriculum comprised of 4 core concepts: science, technology, engineering, and math. The idea is that these 4 disciplines are at the heart of everything we do, and by providing integrated, hands-on exposure to these concepts within a school setting, we will spark an interest and foster higher levels of learning in our children. I was first introduced to STEM learning a couple of years ago when my daughter was in preschool. She was excitedly telling me about a science experiment she and her friends had done in class, and after doing a quick search on Pinterest, I learned that the particular activity she was referring to was a STEM experiment. Having grown up in an era where science, technology, engineering, and math were taught as separate subjects, I was intrigued, and after doing more research, the STEM approach to learning really spoke to me. I made a note to pull together a few STEM experiments my sweet girl and I could do at home together, but then life got busy and…well…I forgot. Pinterest is constantly giving me suggestions on different STEM experiments I should try with my daughter, but I was too lazy to try them. I’ve always felt like science experiments are much more trouble than they’re worth, and I guess I just decided to leave those kind of learning opportunities to my daughter’s teachers. In all the time my daughter has been in kindergarten, she’s never participated in any STEM-related learning activities. Not to my knowledge, anyway. And with spring break and summer vacation looming in the not-so-distant future, I decided it might be fun to give some STEM experiments a try. While I love the educational component of these STEM experiments for kids, they have proven to be excellent ways for me to spend quality time with my daughter, and I hope they bring as much joy to you and your little ones! If you liked this collection of STEM experiments for kids, please share it on Pinterest! And if you’re looking for more ways to have fun with your little ones, please follow our Kids board where we share all kinds of fabulous ideas!